Despite news from the government that unemployment rate is going down and the positive outlook that economists have for our future, people are still feeling unsure about their personal finances. We all want to feel more secure about our future but it seems that it is just not happening. If you feel like you are still anxiously watching the news and obsessing about the state of your personal finances, then you may be suffering from money stress. We all know that you have to do something about this because stress is never a good thing – especially for your health. Let us start by identifying the various reasons why you maybe feeling this stress over your money. There are several causes and knowing them will help you identify the solution to the problem. The first is your mounting debt. Recently, this is what bothers most people because debt can affect how you live your life. Most likely, this is what causes you to worry about your money too. We have been very reckless in the way we used our money and the decisions we made about our purchases. In most cases we ended up needing to borrow money for important expenses because we spent our cash on things that was unnecessary. With debt, you don’t just pay for what you borrowed, you also pay for the interest. When you don’t take care of your spending, you could end up in too much debt that you cannot afford to pay. Inability to pay your dues could end up in a lawsuit that could cost you the assets that you have worked so hard to possess. The overall rise in the cost of living is worrying a lot of people. The food prices are up, utility bills are rising and gas too. Health care is also much more expensive now. If you cannot afford these costs, you may succumb to the temptation of borrowing money just to meet your needs. Unfortunately, our compensation is not increasing along with the rising cost of living. It can be a real problem and you either have to work harder to earn more or lower your lifestyle. That is another cause of worry for people. Not having enough money is always a cause of stress. And even if the government says otherwise, the recession brought a fear in us about the stability of our jobs. Anyone can suddenly lose their careers and that is part of what we fear. We all depend so much on the economy – for our jobs and the prices of the basic necessities. If the economy goes down, these two can be compromised and we could suffer for it. If you do not have your savings, that is also a cause for your worries. With the rising prices and the need to pay your debts with a limited income, that could really take its toll on you. That leaves no room for any savings. And without it, you could end up continually worrying about how you will make ends meet – especially when an emergency strikes. The key to be more confident about your personal finances is to aim for financial stability. This is not just about earning more money. It is having enough for your present needs while having extra to put aside for the future. Here are some tips that you can use to build up your confidence for the future and your finances. Make a financial plan. The only way that you can really be confident about your personal finances is when you have control over it. This is where a financial plan can really help. It will give you an overview of your finances so you can make financial goals for the future. If you have no idea how to make one,you can hire a financial planner. Even one meeting should be enough to point you to the right direction. Make sure that you get a certified professional – someone who is either a member of the National Association of Personal Financial Advisors or NAPFA or certified by the Certified Financial Planner Board or the CFP Board. Pay off your debts. Given your limited income, it is best for you to apply for a debt relief program that will help make your debt payments more affordable. Getting rid of your debts will free up your funds and will help you live more comfortably. That will also keep you from worrying about any garnishments or legal suits. Build up your reserve fund. To achieve financial stability, you need to grow your savings. That will make your future more secure. Regardless of what will happen in the future, your savings can get you out of any tight spot without putting you in debt or compromising your other expenses. Earn more money. By increasing your cash inflow, you get to increase your debt payments and your savings at the same time. That will help build a secure financial future for you and keep you from ever worrying about your personal finances. It also helps if you look for other sources of income so the cash inflow will be secure too. In case something happens to one source, you still have other means that provide you with income. Here is a Howcast video that you can watch. 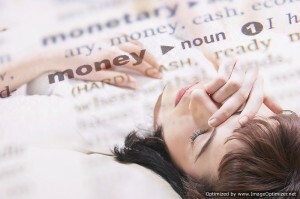 It discusses how you can reduce the stress that you feel about your money.